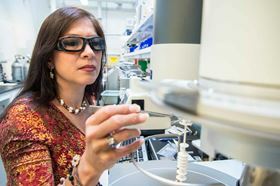 NREL researcher Judith Gomez-Vidal determined the coatings needed to reduce corrosion in concentrating solar power plants. Photo: Dennis Schroeder, NREL 45088. Next-generation concentrating solar power (CSP) plants require high-temperature fluids, like molten salts, at 550–750°C to store heat and generate electricity. At these high temperatures, however, the molten salts eat away at the common alloys used to produce the heat exchangers, piping and storage vessels in CSP systems. New research at the US Department of Energy's National Renewable Energy Laboratory (NREL) shows the potential of using nickel-based coatings to mitigate such corrosion in CSP plants. "We are very excited about the potential implications of this research to provide corrosion-resistant coatings for CSP applications that could improve the economic viability of these systems," said Johney Green, associate laboratory director for mechanical and thermal engineering sciences at NREL. CSP plants with low-cost thermal storage allow facilities to deliver electricity whenever it is needed, by using focused sunlight to produce heat for driving a turbine, helping to support grid reliability. Molten salts are commonly used as both the heat-transfer fluid and for thermal energy storage because they can withstand high temperatures and retain the collected solar heat for many hours. For commercial use of molten salt mixtures containing sodium chloride, potassium chloride and magnesium chloride, the corrosion rate in the storage tanks must be slow – less than 20µm per year – so that a CSP plant can achieve a 30-year life. But when bare stainless steel alloys are tested in a molten chloride, they corrode at rates as fast as 4500µm per year. The solution to this corrosion problem could lie in research conducted by NREL's Judith Gomez-Vidal and reported in a paper in Materials Degradation. Gomez-Vidal applied different types of nickel-based coatings, which are commonly used for reducing oxidation and corrosion, to stainless steel. One such coating, with the chemical formula NiCoCrAlYTa, showed the best performance so far. It limited the corrosion rate to 190µm per year; while not yet reaching the goal of 20µm per year, this still represents a large improvement over the uncoated steel, reducing the corrosion rate by 96%. That particular coating was pre-oxidized over a 24-hour period, causing the formation of a uniform and dense layer of aluminum oxide, which served to further protect the stainless steel from corrosion. "The use of surface protection is very promising to mitigate corrosion in molten salts, in particular to those surfaces exposed to chlorine-containing vapor," said Gomez-Vidal, who holds a PhD in metallurgical and materials engineering. "However, the rates of corrosion are still considerably high for CSP. This effort highlights the relevance of testing materials durability in solar power applications. More R&D is needed to achieve the target corrosion level needed, which could include the synergy of combining surface protection with chemical control of the molten salt and the surrounding atmosphere." Additional tests will involve evaluating the coatings under thermal cycling and introducing oxygen-containing atmospheres to increase the oxidation potential of the systems. The addition of oxygen ensures the formation of protective scales that could reform in the presence of oxygen if cracks appear during operation. Gomez-Vidal has recently published other work in which such aluminum oxide layers were able to grow and remain adhered to the surface in the presence of air during the thermal cycling of samples. This story is adapted from material from NREL, with editorial changes made by Materials Today. The views expressed in this article do not necessarily represent those of Elsevier. Link to original source. Stress-corrosion cracking can occur when a metal is exposed to tensile stress and corrosion separately, as well as simultaneously.